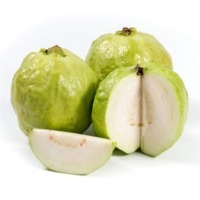 Browse guava suppliers by country and region. 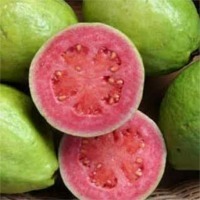 It is believed that Guava originated from Central America, although it is currently grown in most tropical countries. 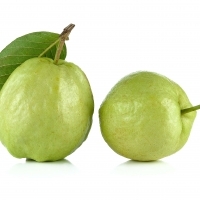 The main producing countries are located mainly in Sotheast Asia as well as Brazil, Mexico and Nigeria Guava has a rounded shape like an apple, although depending on the variety it is treated it can also be narrowed towards the peduncle, resembling a pear. Of green skin, the pulp is white, with cream tones. It is full of seeds of hard constitution and woody texture. Regarding its size, it varies greatly depending on the variety, measuring between 4 and 12 centimeters in length and 4 to 8 in diameter. It can weigh from 50 to 500 grams. Commercially they are grouped in white and red, according to the coloration that the pulp presents. The most remarkable varieties depending on the country from which they come are: Red, Polonuevo, Guayabita de SadonÃ¡ (NariÃ±o), Rosada and Blanca ComÃºn de Antioquia and Guayaba Agria. 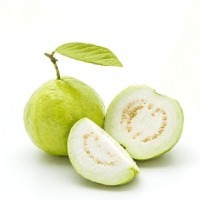 Guava is composed mostly by water and its carbohydrate content is quite low. It contains hardly any proteins and fats. Very rich in vitamin C (7 times more content than in an orange) With regard to minerals, its potassium content stands out in case of suffering from kidney disease. It also provides a considerable amount of fiber that facilitates intestinal transit. Ideal to soothe sore throat. In cases of stress. 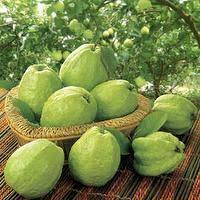 Our Guava are sourced from growers in Thailand, India, China, Philippines and Indonesia. 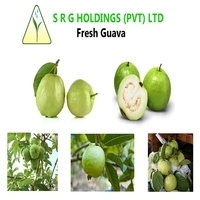 We have high quality guava fruit packed and air shipped. Of the highest quality and size range from 350 gms to 600 gms each. Can ship in smaller quantities also. Short on time? Let guava sellers contact you. 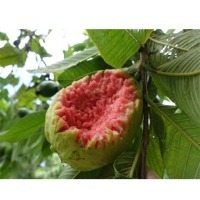 We mainly produce Bangkok Giant guava variety. The Bangkok Giant is a round fruit weighing approximately 250g - 500 g. The flesh is white and the taste is crispy and sweet. The skin is dark apple green in its salad days but turns light green in maturity when it is ripe for plucking. 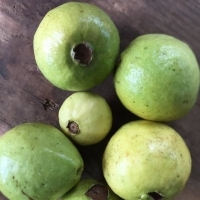 The flesh is white with pale yellow seeds and tends to be drier than the pink type of guavas. Bangkok Giant guavas are mildly sweet and have very little fragrance. The crunchy flesh and hard seeds are both edible. Bangkok Giant Guava is rich in vitamins A and C with seeds that are rich in omega-3, omega-6 polyunsaturated fatty acids and especially dietary fiber. A single Giant Guava fruit contains over four times the amount of vitamin C as a single orange (over 200 mg per 100 g serving) and also has good levels of the dietary minerals, potassium, magnesium, and generally a broad, low-calorie profile of essential nutrients. Harvest could be obtained throughout the year but March, April and July, August are the highest bearing seasons. Currently we have cultivated 7.1 ha with Bangkok Giant guava variety. 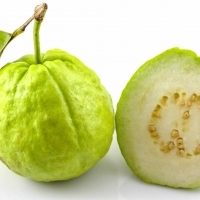 Guava : Mildly acidic, refreshing fruit best-eaten when crisp outside and medium-soft on the inside Benefits : Guava contains nutrients that help curb all kinds of illnesses, including cancer and diabetes. Its vitamin A content is five times that of an orange, and it also has stellar amounts of protein, fiber, and folate, and possibly more vitamin C than any other fruit. Depending on the species, guava can be of tomato size or as large as 13 cm in diameter. To eat: use a knife to slice the fruit lengthwise into 4-6 pieces, slice off the part containing the seeds; the kin is bitter but edible. Guava is often ready to eat when it is green and crisp. The flesh is crunchy much like eating a slice of apple. The taste is pleasant with mildly acidic flavour. Some Vietnamese however like to eat the guava when it is not completely ripe (i sng) together with a dip made of fish sauce (Nuoc Mam), chilli, salt and sugar. Sometimes, the guava slice is dipped in a mixture of salt and grounded red chilli pepper. The Mekong Delta's "i XÃ¡ L" variety is probably the most famous guava in of Vietnam. 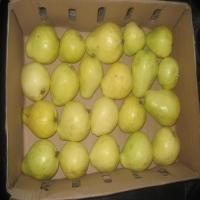 SPECIFICATION: Grade : A Color : green skin and white flesh Weight : over 0.20-0.25kg/piece Packing : in 10kgs/ carton We hope that our specification will meet your demands, and you be interested in our products.